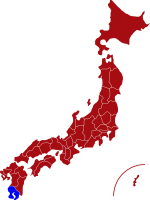 Kagoshima prefecture is located on the southern tip of Kyushu Island and covers an area of 600 square kilometres. It is naturally blessed with spectacular scenery and is home to many wonderful hot spring resorts. 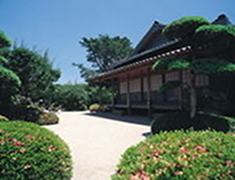 On the north coast of Kagoshima there is a traditional Japanese-style landscape garden called Senganen Garden. This park was designed and constructed in 1658 by a feudal lord as a garden and is popular for the stunning views offered of Sakurajima (Cherry Blossom Island) and Kagoshima Bay. Within the grounds of the Senganen is the Foreigners' Mansion (Ijinkan) which was built in 1866 to house seven engineers from England brought over to Japan to set up a textile factory. Located along the Satsuma Peninsula 34 km from the city centre is the picturesque town of Chiran, famous for its carefully preserved samurai houses and gardens. Inside the town is the Chiran Peace Museum for Kamikaze Pilots which has aircraft, photographs and personal belongings, including letters and poems on display in memory of the ultimate sacrifice made by the young pilots during World War II. Amongst Kagoshima’s many festivals held throughout the year are the Sogadon-no-Kasayaki (Umbrella Burning Festival) held at night in July and the Isle of Fire Festival also held in July. For more information about Kagoshima prefecture, see their official tourism website. 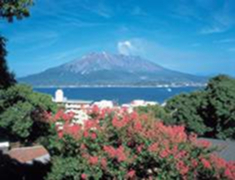 Air - Kagoshima has regular domestic flights to Tokyo, Osaka, Nagoya, Fukuoka as well as to the islands of Kagoshima. The airport is located about an hour away from the city centre. Click here for its English website. Rail - The main station in Kagoshima is "Kagoshima Chuo (鹿児島中央)", not to be confused with "Kagoshima (鹿児島駅)", which is the older and less used of the two stations. Sakurajima is one of the world’s most active volcanos and considered to be the symbol of Kagoshima. The island is located just 4 km by ferry and remains one of the most popular attractions to visitors to the city. Chiran Samurai Residence - This beautiful town of old traditional streets is known as “Satsuma’s Kyoto”. The district is where higher ranked samurai lived during the Edo Period. The town has been carefully preserved in its original condition and many of the houses are still lived in. Ibusuki Natural Sand Bath is one of the most unique and beneficial hot spa experiences in the world. 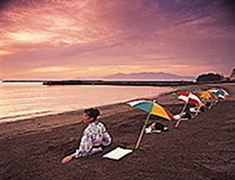 Visitors lie on the beach wearing a light cotton kimono and are buried under hot spring warm sand. 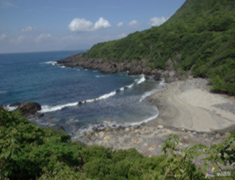 Yakushima Island is regarded as a trekkers' paradise for its beautiful nature and stunning scenery. It is registered as a UNESCO World Natural Heritage Site and home to the world’s oldest Yaku-sugi tree which is more than 7,000 years old.